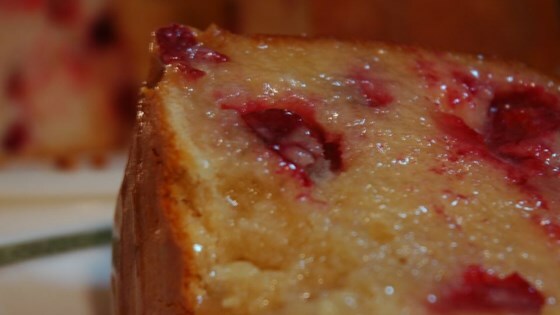 "An absolutely delicious cranberry Bundt cake. The hot butter sauce is to die for. Great for the holidays!" Preheat oven to 325 degrees F (165 degrees C). Grease and flour a 10 inch Bundt pan. Mix together the flour, baking powder and salt. Set aside. To make the Hot Butter Sauce: In a saucepan, combine 1 cup butter, 2 cups sugar, and cream. Bring to a boil over medium heat, reduce heat and let simmer for 10 minutes. Remove from heat and stir in vanilla. Serve slices of cake generously covered with hot butter sauce. I made this for Christmas last year and my family couldn't quit raving about it. I will definitely be making it again. I added rum to my butter sauce and it was DELICIOUS! Yum.